Be the first to share your favorite memory, photo or story of Deaconess Mary. This memorial page is dedicated for family, friends and future generations to celebrate the life of their loved one. Mary Louise Gardner was born June 7, 1923 in Loretta, VA to the late Robert and Virginia Gardner and transitioned in Supply, VA to be the with the Lord on April 13, 2018. She accepted Christ and was baptized at the First Baptist Church of Loretta at an early age. She was a graduate of Essex County Training School where she met and soon married Mansfield Coleman. 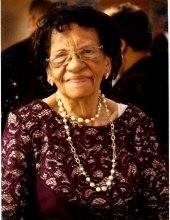 From their union, 5 children were born and Mary became a lifelong member of Ebenezer Baptist Church where she served as a Deaconess, sang joyfully in the Senior Choir and served others in the Senior Missionaries Ministry. Deaconess Coleman’s passing leaves a void in the lives of many who will cherish fond memories, including one son, Robert “Bobby” Coleman; four daughters, Virginia Ann Cameron (Dr. Johnnie Cameron Jr.), Shirley C. Latney (John Latney), Faye C. Smith, and Delphine Davis; her brother, Robert Gardner Jr., 9 grandchildren, Waverly, Rodney, Terrell, Jerry, Marcus, Danita, Jameka, Johnnie III, and Kristin; 23 great grandchildren, 2 great great grandchildren, a great niece who loved & cared for her intently Dellie Brent and a host of nieces, nephews and cousins. We celebrate in the fact that she is now reunited with her husband Deacon Mansfield Coleman and that their loving legacy will continue to live in their family & friends. To send flowers or a remembrance gift to the family of Deaconess Mary Louise Coleman, please visit our Tribute Store. "Email Address" would like to share the life celebration of Deaconess Mary Louise Coleman. Click on the "link" to go to share a favorite memory or leave a condolence message for the family.